A growing body of evidence suggests that Voyager 1 is flying through interstellar space. Earlier this year, scientists at NASA started speculating about how close the 35 year-old Voyager 1 spacecraft was to crossing the border between our solar system and interstellar space. Now, barely a few months after those talks, scientists have revealed something really exciting: Voyager 1 is sending home data that suggests it may already be flying through interstellar space. The science of distinguishing interstellar space from our-solar-system-space is still in its infancy (when Voyager 1 leaves our system, it will be the first human-made object in history to do so). To try and predict when Voyager might make the leap, NASA scientists set about investigating what kind of conditions the craft could encounter beyond our solar system, basing much of their hypothesis on how they expected our sun's solar wind (the tiny charged particles it spends its life spraying across the sky) to smash into the edge of the system and spin sideways, leaving Voyager well alone. If the craft was still picking up the solar wind, cool, it was still in our little corner of space. If not, it had crossed the border into the great unknown. But, hey, this is science. Instead of finding a neat solar wind barrier, Voyager 1 discovered that once you get close to the edge of interstellar space, our sun's solar wind just sort of tapers off and then stops dead. While fascinating, the discovery of this "stagnation zone" (as described in Nature) managed to scupper most of NASA's preconceptions about day-to-day conditions in interstellar space. "There is no well-established criteria of what constitutes exit from [our solar system]," said Stamatios Krimigis, NASA principal investigator in charge of Voyager 1's Low-Energy Charged Particle instrument, in an interview. "All theoretical models have been found wanting." Despite this, there are still three factors that most scientists agree would consitute evidence of an exit from our solar system if a craft experienced them in tandem. First, the craft would have to experience an increase in collisions from charged particles found in interstellar space. Second, the rate at which solar particles collided with it, irrespective of where these particles might be going, would have to drop dramatically. Finally, the craft must be able to detect a change in the direction of the magnetic fields surrounding it; once the craft is beyond the grasp of our sun, the fields around it should shift to reflect the direction of magnetic fields in interstellar space. "Most scientists involved with Voyager 1 would agree that [criteria one and two] have been sufficiently satisfied," said Ed Roelof, a scientist at Johns Hopkins who works with Voyager 1 data. "[The change in magnetic field direction to that of the interstellar field beyond the influence of the sun] is critical because, even though there is debate among astrophysicists as to what direction the field will lie in, it seems unlikely that it is the direction that we have been seeing at Voyager 1 throughout the most recent years." "That is why we are all awaiting the analysis of the most recent magnetic field measurements from Voyager 1. We will be looking for the expected change to a new and steady direction. That would drop the third independent piece of evidence into place - if indeed that's what will be seen," concluded Roelof. 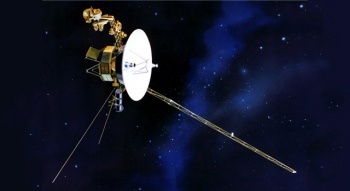 "Once we have a consensus within the team we will inform NASA for a proper announcement," added Krimigis, commenting on how the agency will go about telling the world of Voyager 1's exit if the data is confirmed in the coming weeks. What we can gather from this is that is it the case, or will in all likelihood soon be the case, that something built by the hands of humans is ready to explore the universe beyond our solar system. Although most of its highly sensitive sensors were shut down years ago to conserve energy, Voyager 1 is still packing enough functioning equipment to send back some data on real conditions outside our pocket of space. How will magnetic fields behave beyond the reach of our sun? What's the deal with the solar wind getting to the edge of our system and then stagnating? The mind boggles both at what Voyager 1 might find, and what effects its discoveries might have on any number of standing preconceptions in astrophysics. Way to go, little guy. Way to go.